Learn more about iFixOmaha. We've saved tens of thousands of customers time and money since opening our doors in 2012. We've been voted First Place Best of Omaha for Smartphone Repair every single year and local schools and businesses trust us for a wide variety of repair services. iFixOmaha has saved tens of thousands of customers time and money since opening our doors in 2012. We've been voted First Place Best of Omaha for Smartphone Repair every single year and local schools and businesses trust us for a wide variety of repair services. iFixOmaha is the 2017 first place winner of the Best Of Omaha smartphone repair competition. 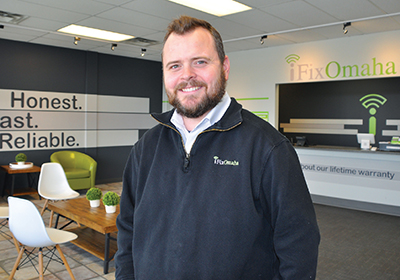 Our owner, Jason DeWater, is a member of the 2017 Midlands Business Journal top 40 Under 40.
iFixOmaha repairs consumer electronics including smartphones, tablets, laptops, computers, and more by manufacturers including Apple, Samsung, and LG. Our smartphone repairs take 30 minutes, in most cases, and come with a lifetime warranty on all parts and labor. Our technicians must satisfactorily complete instruction to earn the right to make certain repairs to your device. We provide ten levels of complete training; techs advance only when they prove their skill. Our ten-levels of certification are cumulative and when a tech successfully achieves the ten-level certification he/she is eligible to become store manager. Our objective is simple, to restore your device as quickly and inexpensively as possible. Our trusted techs are the best in the business, and local school districts, corporations and non-profits, and thousands of happy customers trust them to do the job right the very first time. Our straightforward and cost-effective repair process has saved our clients time and money for years, and we continue to hold true to our values: Honest. Fast. Reliable. Our Mission Statement is: "All mobile devices repaired and protected by iFixOmaha where excellence is personified, customer and community compassion is the purpose, and business success is the plan." Our Values are: Honest, Fast, Reliable. Jason DeWater, the founder of iFixOmaha, has grown his electronic and machine repair company into one of the largest of its kind in the nation. Servicing all makes and models of mobile hardware devices, DeWater's team services smartphone, laptop, and tablet customers, while managing school district fleets and offering concierge service to corporations in the Omaha metro area. Google featured iFixOmaha as Nebraska's representative in its Economic Impact Report published in 2017. The report cites the rapid growth of the company, its increasing sales volume, and the new tech jobs created. Also in 2017, iFixOmaha received first place honors in the Best of Omaha competition for smartphone repair. The Midland Business Journal named Jason as a recipient of its 15th annual "40 Under 40 Awards," held in November 2016. Jason is a classically-trained musician and was appointed as the full-time Principal Horn of the Omaha Symphony in 2007 after winning the post's international audition.